An image of the Nike HyperAdapt 1.0 is projected on a screen as Nike CEO Mark Parker speaks during a news conference, Wednesday, March 16, 2016, in New York. Nike Inc. has unveiled its first power-lacing sneaker — it allows users to make the fit looser or snugger on the fly by pressing buttons on the side of the shoe. The world's largest sportswear brand, based in Beaverton, Oregon, unveiled the sneaker along with a host of other innovations Wednesday at a media event in New York. Other innovations Nike highlighted include "anti-clog traction," which uses technology that prevents mud from sticking to the soles of soccer cleats. 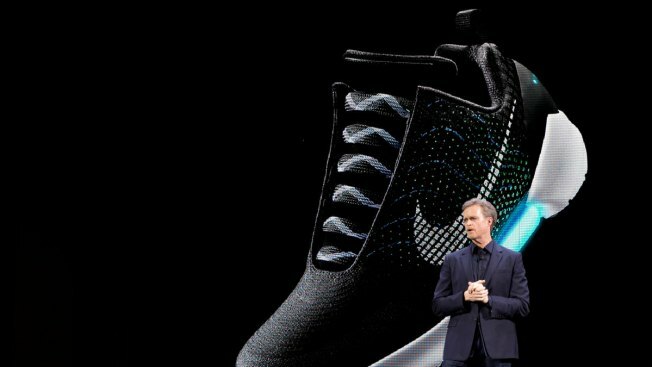 "We've entered a new era of personalized performance," said Mark Parker, Nike's president and CEO. "Today, athletes want more than just a dash board. They want a relationship." Nike says that the potential for shoes with adaptive lacing is huge because it provides tailored-to-the-moment custom fit. When users step into the shoe, their heel will hit a sensor. The athlete then can press two buttons on the side that adjust the grip. But Nike says that in the future, it won't be manual. The sensor could sense when the user needs to have the shoe tighter or looser. The self-lacing sneaker, which is called "Nike HyperAdapt 1.0," will be out starting the holiday season and will only be available for members of its loyalty Nike+ app. It will be available in three colors. The price was not revealed. "The adaptive lacing system is an excellent first step towards truly adaptive personalized footwear," said Matt Powell, sports industry analyst at NPD Group Inc., a market research firm.